Within my Driver’s License Restoration Practice, a significant percentage of all the Driver’s License Restoration cases I handle are for Clients who live outside of the Detroit area. I have Clients from all corners of Michigan, and from all corners of the continental U.S., as well. No matter where they live now, all these Clients have one thing in common: They formerly held a Michigan Driver’s License which was Revoked because of multiple DUI’s. 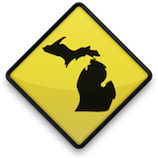 For those that no longer live in Michigan, the implications of a Michigan Revocation can be frustrating, to say the least. There are lots of reasons people leave Michigan, but it’s safe to say that in all cases, it wasn’t because things here were going too good. In some cases, people move to some place where transportation isn’t a problem. In others, the prospect of good paying work entices them to leave, figuring that being somewhere warmer and making money, even without having a License, beats being cold, unemployed, and still having no License. So they start researching. And they soon learn that in order to get that “hold” released, they need what’s called a “Clearance” from Michigan. Perhaps the critical difference between those who still have a Michigan residency and those who do not is that any resident can and will ONLY win back a Restricted License. A Michigan resident CANNOT win a full, unrestricted License. By law, a Michigan resident will have to serve at least 1 year on a Restricted License with an ignition interlock system in whatever car they drive, None of this, however, applies to people who have moved out-of-state. Because Michigan has no authority or jurisdiction over non-residents, it cannot dictate the terms of any License a person gets elsewhere. This means that Michigan can only release its “hold” on a former resident’s License, thus allowing the new state to do whatever it can or will under its own laws. In practice, winning a “Clearance” is often thought of as the same thing as winning a full License, because every state I’ve dealt with will, once someone obtains a Michigan “Clearance,” gives the person a full, unrestricted License. The process by which this Clearance is obtained is, in every respect, absolutely identical to that in which a Michigan resident has their Driver’s License Restored. Understandably, coming back to Michigan to clear this all up sounds, in most cases, like a big burden and expense. And it is. Therefore, many people are inclined to try the less-expensive Administrative Review, which is essentially an Appeal by mail. In prior articles, I have explained why I don’t favor such a course of action. For all my explaining, according to the State itself, nearly 3/4 of all such Appeals lose. On the other hand, I have won about the last 175 out of 177 Appeals I’ve handled in just over the last 2 years, giving me a win rate of better than 98.8% (with a guarantee that I’ll win any License Appeal I accept, or the next is free). It is not merely the statistical odds that are the problem in these “do it yourself” Appeals, it’s the fact that, once a person does lose, they not only have to wait another year to file a new Appeal, but that new Appeal needs to specifically address and fix those problems that caused the first Appeal to lose. In other words, the vast majority of people who try on their own aren’t just going to lose, they’re going to lose, and make things worse than before they started, making the next Appeal even harder. That’s not to say I’m not used to that. In my Practice, a sizable portions of the out-of-state Appeals I handle are for those who’ve tried before and lost. As much as I point out the risks involved in these “do-it-yourself” Appeals, my philosophy regarding them may seem counter-intuitive. I say “go for it.” Then, when it doesn’t work out, call me next year. While that may, at first blush, sound cold, or harsh, the reality is that it is far easier to work with someone who has firsthand knowledge of how involved these Appeals are than it is to try and convince someone of that. And, in my position, I simply do not have the time to try and dissuade someone from going it alone. Better they call me the following year when all such doubt has been erased. The procedure I use for both out-of-state and distant Michigan Clients is simple; Usually a Client sets up an appointment to come and see me for about 3 hours (often, a bit more) on the day they also have a Substance Abuse Evaluation scheduled at the Clinic a few blocks from my Office. Sometimes people have family here, so they might see me the day before their appointment, but however is works out, it is imperative that I meet with them first, in order to prepare them to have the Substance Abuse Evaluation completed. As far as the “local Clinic” goes, I have no ties with them, beyond being able to say that they do an excellent, first-rate job in completing these Evaluations. The State is on the lookout for any Evaluation that reads more like a “snow job” than an accurate and honest assessment. The Clinic I use NEVER produces anything except a clear and honest product. This means that if a person DOES NOT do well enough in their assessment, the Evaluation will reflect that. This is why I spend at least 3 hours preparing the Client for this. If it was easy as just “buying” a good Evaluation, then I could simply meet the Client, shake their hand, take their money, and send them on their way. As I have noted in other articles, there simply are no shortcuts here. In order to win a License Appeal, a person must be willing to do the work and spend the time necessary to produce a winning product. After the Evaluation has been completed, and after I’ve corrected and edited the Client’s legally-required Letters of Support, and upon a final review to make sure everything is in order, that there are no conflicts amongst dates, and no other errors that can result in a Denial, the Appeal is filed. I will only handle a case that is set for a live, in-person Hearing. I do not do Administrative Appeals, nor do I get involved in video Hearings. Because my Office is in Metro-Detroit, all the Hearings I have are set at the Livonia Office of the DAAD, no matter where a Client lives. I see the same Hearing Officers week after week, so I know all about what each will focus on with any given Appeal. At the Hearings I hold, I do NOT bring in live witnesses. Typically, the Hearing itself is scheduled about 6 weeks from the filing date. Once the Hearing date has been set, the name of the Specific Hearing Officer to which the Appeal has been assigned is given, and I can begin preparing the Client for not only the Hearing in general, but exactly how their specific Hearing Officer will do things, and what areas of the person’s alcohol history and Recovery they will be focusing on. In the end, the Client will get their Clearance. With that, they can go to the DMV in whatever state they live in, get a License, and finally get back on the road.